Scent Strength: Salient Eucalyptus & Drury Lane were moderately strong. Braeburn & Cassia had a soft throw. I have been on a hiatus from candles and melts for what has seemed like an eternity. 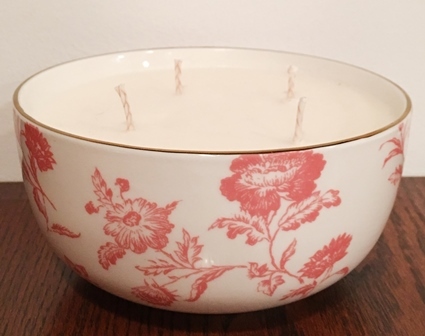 When I was ready to jump back into candle burning and reviews, I was ecstatic to learn of a relatively new luxury candle company, Adia Candle Company. I was asked to review the entire scent line, currently 9 scents in total. I’ll be spreading these candle reviews out in three parts. 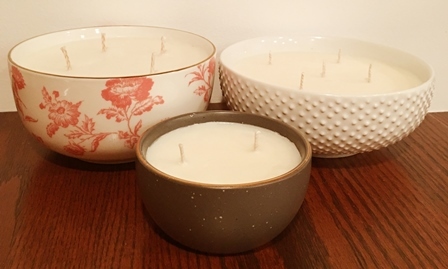 The first set of candles I will review are grouped together because they came in beautiful, decorative keepsake bowls: Salient Eucalyptus, Braeburn & Cassia, and Drury Lane. Anyone who knows me knows I have a ‘thing’ for luxury candles. It’s not just the complexity of the scents, but it’s also the presentation. When spending a lot of cash for a candle, I not only want it to smell good, but I also want it to LOOK good. 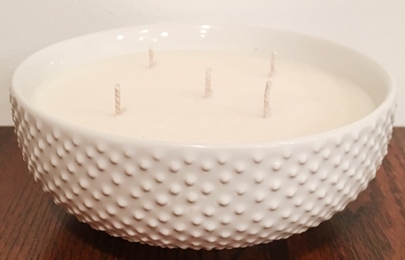 I can assure you, these bowl candles from Adia did not disappoint! Salient Eucalyptus was in a 20 ounce white beaded ceramic bowl. The bowl was heavy and felt luxurious in my hand. The white color was crisp white, and the beading reminded me of hobnail milk glass. There were a total of five wicks in this huge candle, four around the circumference and one in the center. Perfect for this size candle! Braeburn & Cassia was in a decorative pink and white bowl with a stunning gold rim. The bowl itself was white with a pink floral pattern all around. This bowl felt more delicate in the hand but still very luxurious. There were four wicks in this particular candle. Drury Lane was in a smooth, grey bowl with two well-placed wicks. There were some random white specks on the bowl, but otherwise, no markings. It felt cool and heavy in the hand. The wax for all candles was an off-white color, typical of natural soy wax. The wicks were nice and thick – obvious good quality. I was off to a great start with these candles, as they sure did dress to impress. What did my Adia bowls candles smell like? This blend of scents sculpts a brilliant arrangement of peppermint, eucalyptus, and spruce, to create an invigorating bouquet that fills the room. 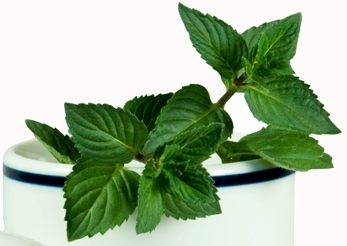 Honestly, on cold sniff I only smelled the brisk eucalyptus and invigorating peppermint. No spruce. I decided to light this huge candle in my living room (a fairly large space) because I wanted to put this one to the test. It was not long before I was met with a fresh, crisp, clean scent wafting in the air. As the surface wax continued to melt, the scent became stronger and more invigorating. Once it got going, I could really tell the complexity of the scent. The evergreen notes from the spruce filtered through and the peppermint became more noticeable. It definitely filled the room, but it did not overpower the space. I would consider it moderately strong, which I actually found perfect for this particular scent. This scent is the quintessential fall scent when it comes to apples & cinnamon being partnered in order to polish the perfect autumnal feel in your home. Once lighting in my living area, I was able to get the full apple-cinnamon mix. The scent was smooth and slightly sweet. 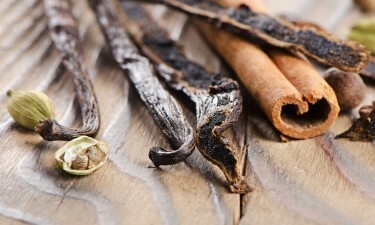 Cinnamon can sometimes overpower a scent combination, but not so here. When I walked back into the room, I immediately felt coziness and warmth. This candle actually did better in a smaller room because the scent was too soft for the larger space. Lighting this candle in cold weather is sure to bring a certain charm to the kitchen. It fills the room with a warm spice that would be associated with a medley of fall smells that could only be associated with a bakery. The description for this one was spot on. I first lit this candle in my large living area, but when I returned several minutes later, I could tell that wasn’t going to do the trick. I moved the candle to a small bathroom, and that was where this candle shined. It filled the space with a warm, sweet vanilla smell with just enough cinnamon to give it a little kick. This was a perfect scent for Fall – for cozying up by the fire, telling ghost stories, and throwing back S’mores. I loved this one to the last light. Given the smaller candle size, the scent was moderately strong – it just had to have the right space. How did my Adia bowl candles burn? I am often leery of candles with more than 3 wicks, because I’ve had experiences with them not burning the wax all the way to the edges, creating an inadequate melt pool (or tunnel). I had the 5-wick, 20-oz candle (Salient Eucalyptus) lit for several hours on first burn. The wax melted almost fully to the edges. There was still a small rim of wax left on initial burn, but it fully melted during my subsequent burns. No problems with the 22 ounce floral bowl (Braeburn & Cassia) either. Even though it was the larger candle, it only had four wicks (as opposed to the 5-wick, 20 oz beaded bowl candle). The mouth of this candle was not as wide as the beaded bowl, so the 4 wicks made sense. I did got a full wax melt pool in no time with this candle, and it burned flawlessly throughout. The 8-oz Drury Lane candle also burned well with two wicks. A full wax melt pool was fairly easy to obtain. This candle burned all the way down and lasted for hours on end. A very slow burning candle in spite of its smaller size. I didn’t notice any black soot when burning any of these candles. Very clean burns! My only trouble was the wicks once burned. The wicks seemed almost self-trimming, so they didn’t take much trimming in between. I was a little too aggressive after my first light and then I had to struggle getting my wicks relit. Totally my fault, and just a heads’ up for those new to these candles. I loved, loved, loved these candles! The looked AMAZING while burning and were relatively maintenance free. Of the three candles, I found Salient Eucalyptus and Drury Lane the strongest. They each filled the rooms they were in. I think if I had a larger candle in Drury Lane, it would have done just fine in my large living room, and overall it was my favorite scent. Braeburn & Cassia was a lighter scented candle, but it still smelled wonderful. I see this scent as a perfect mood-setting candle, getting you ready to enjoy a night by the fire. The added bonus? The gorgeous bowls that were left after burning all the wax down! I placed my candle bowls on a candle warmer to soften up the remaining wax. Then I was able to wipe each bowl clean and put them to work throughout my home. These are candles you would enjoy from start to finish and then some! I am off to a great start with Adia Candle Company, and I can’t wait to try the other scents available. Be sure to stay tuned! Woodsy / green fragrances are my favs, and your Drury Lane bowl is simply lovely. Having both a cat and a dog in a two room cabin gets a wee bit stuffy esp. in the summer. Speaking of summer…. if you can ever get a candle to smell like grass (the kind you mow, not the other), I’d buy one in a New York minute! (My home town , you see). Am now living in south central Ohio and trying to connect with some of the cottage industries here. If your candles smell as nice as they read, things could happen! Let me try the eucalyptus first and if I like that, may try some others. We’ll see how it rolls. Thanking you in advance, I look forward to smelling some lovely fragrances. Thank you for your kind words, we at Adia appreciate hearing feedback from those people around us that truly care. We look forward to your Eucalyptus order! Andrea reviewed 3 new scents from Adia Candles. Aged Spruce, Crafted Vanilla Noir, and Midday Mojito. I think she liked them all.